Kedaar's school celebrated father's day with an ice cream social. All the kids some activities like solving a puzzle with dad, enacting an enimal(parent has to guess) and some other fun things. All the kids also made some presents for their dads. Chandra attended the party and here are some pictures from the occassion. 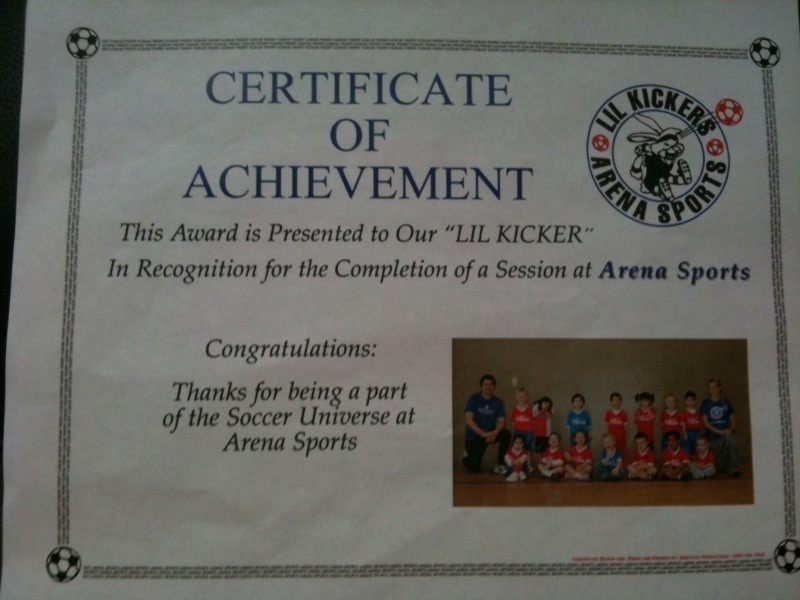 Kedaar completed 2 series of soccer classes from January this year at Little Kickers. In the second series, we couldnt go for a lot of them (around 4) because we either were out of station or Kedaar was sick. 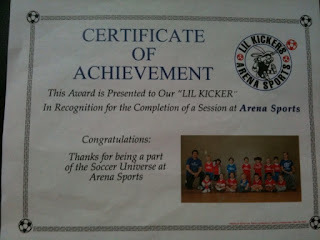 Overall Kedaar had fun in the classes and we want to join him in little advanced sessions as a next step. I think Kedaar has excellent road sense and memory power. These 2 combined, we just get surprises very often whenever we are in car. 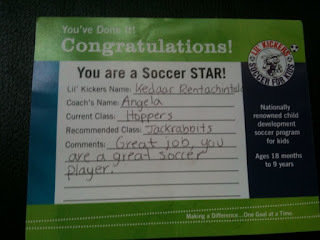 He knows very clearly the roads to his soccer class, temple, school, shops that we frequently go to and finally the home. Not only the destination, he very clearly remembers the different places that come on the way to these places. If we seem to go on little bit different road, he will keep reminding us "mummy, this is not the way to school, are we going in differnet route", "daddy, this is not the way to soccer class, can we turn around and go". When we were in India also, he used to exactly remember each and every place we went and road to get to it. Some interesting things happened this weekend also. 1. We were going to a place in redmond and we had to cross park. Chandra asked "kedaar, did we come here before , this looks familiar". Kedaar instantly said, "yes, daddy, this is where Neha celebrated her birthday". Its been around an year since her birthday is over. 2. We went to attend Jayaprakash Narayan's speech in redmond library around a month and half back. We were taking a turn on that road, Kedaar shouts "Daddy, we came here to hear the speech, the uncle's speech"
3. We were going to friend's house in Klahanie yesterday. Suddenly Kedaar says "Muumy, daddy, we just passed Tax aunty's house, we came here before". That is amazing, we went there just one time back in April that too by missing a couple of roads. Now when he sees the house, he just could remember it. 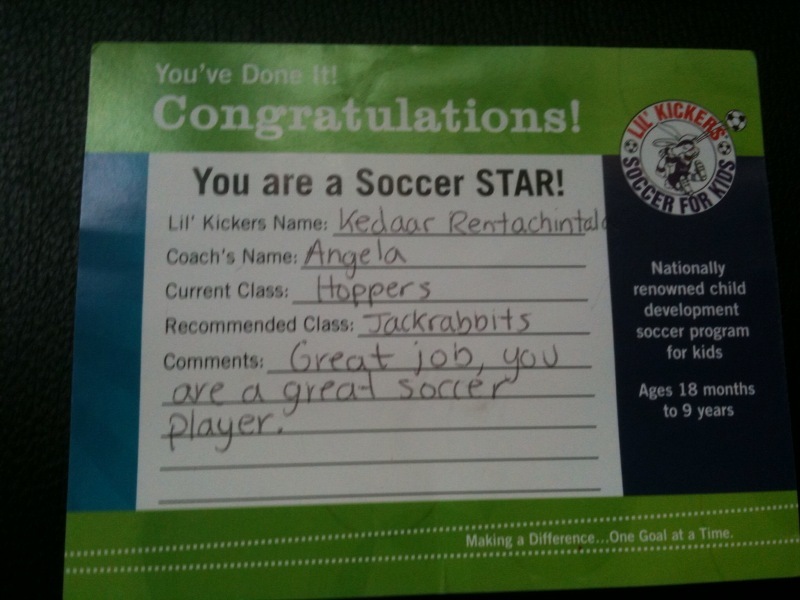 It was very nice and amazing to know that kids have so much intuition and memory power. I am travelling to New Orleans for MS TechEd conference tomorrow morning. I will back Friday early morning. Kedaar and Chandra need to be by themselves during this time. I went to LA last year around this time and it was a 6 days trip then. Kedaar did OK during that time. This year, he grew up more, understands more. When I started to prepare him around a couple of weeks back, I kept telling him that I need to go alone because its office work. Still he would politely ask me "mamma, can I please come with you, I like office work vacation". I didnt want to hurt him one time and said "Yes", then he says "thank you, can daddy also come because we are all family , we all need to go in the flight" :). Slowly I started telling him that the family will go to another vacation to Mexico this summer. He then went and told several friends he met during these 2 weeks that his mommy is going to New Orleasns for office work and then we are all going to Mexico afterwards. Anyway, I suspect that he is still thinking this as me trying to scare him to make him to do something. Hopefully he will do just fine with his busy school, activity classes. I am going to miss him very much and will wait to come back.